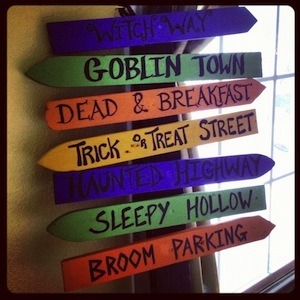 This Halloween sign made from fencing materials is multicolored and certainly inspirational. If you’d like to keep your paint costs down though, I’ve seen the same thing done with black background paint and white lettering. Both versions are cool though, and allow you to make up your own spooky seasonal phrases. 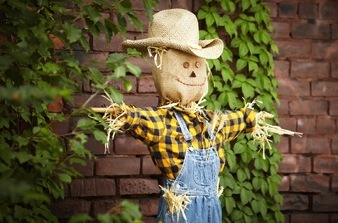 Whether you’re posing them on your porch, a hay bale or standing up straight in your yard, homemade scarecrows are a fun and simple project that keeps the holiday classic and lets the kids have a blast. Use old clothing you have around the house or hit the thrift store to stay on budget. 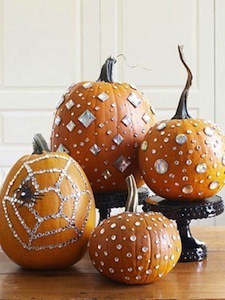 Whether you are carving the ultimate Jack-o-lantern, covering your squash in glitter or bedazzling your pumpkins like this project from Good Housekeeping shows, there are plenty of ways to decorate these Halloween classics that will have the compliments flowing. You can even paint scary faces on them and top them with fun hats. The point is to make sure pumpkins play a part in your Halloween crafts schedule. They are also a great item to turn into fun fall treats, as this article on penny-pinching pumpkin recipes demonstrates. My favorite? A frosty pumpkin margarita to enjoy with friends! If you’re looking for Halloween crafts that will work for kiddos ranging from tots to tweens, then these painted pumpkin rocks are sure to please. You can craft small ones to use for paper weights or even refrigerator magnets, or go larger for a homemade seasonal doorstop. Granted, you probably don’t want to paint over that expensive landscaping rock in the front yard, but there are plenty of freebies kicking around in the woods you can grab. For those that live in the city, you may want to go with a bag of craft rocks from someplace like Michael’s or JoAnn’s. If you have access to a local craft fair, this is also one of those nature craft ideas for grownups that can be used to generate a little extra cash before the next round of holiday expenses starts to hit your wallet. I used to make these in the classroom with the students, but Martha Stewart has a hanging bat template that’s a bit larger if you want to make some to hang from the ceiling in your entryway or from the roof of your front porch before the trick or treaters arrive. I love this idea for a couple of reasons. First, it allows you to use canning jars creatively. Since they are one of my favorite all-purpose supplies for the home, this project was sure to make the cut. Second, these mummy luminarias from Better Homes and Gardens use only the most basic of supplies and look great even if a young child is helping you make them. Avoiding the frustration level is always a good idea where family crafts are concerned. Plus, these luminarias make a great walkway decoration if you are hosting a grownup event with Halloween cocktails and classic horror movies. There are many more Halloween crafts to enjoy making, but this list offers an affordable place to start and projects that are achievable even if you aren’t the most craft capable. What are some of your favorite things to make for Halloween? I seen some easy Halloween costume ideas at babymingle that someone might like. They tell you how to make your own. Cool pumpkins, they will keep better too because they are not cut up. A few more Halloween crafts ideas are at babymingle also I made a homemade costume from there. Please post more Halloween costume ideas to make.